They are interest free while you are in school. Interest only starts to accrue once you are finished school. Application forms for the Canada Student Loan Program may be obtained from your high school, the Department of Education in your home province, admissions staff at CMU, or by clicking on your home Province or Territory from the list below. Those marked with an * allow for you to apply online for a student-loan for studies at CMU. Get Creative. Host a fundraising event. Students in the past have been quite creative. We’ve heard of garage sales, car washes, fundraising dinners or desert nights, coffee houses, and more. Take some time to think about a creative way to provide people with an experience, or service that they will support you through. Church Support. 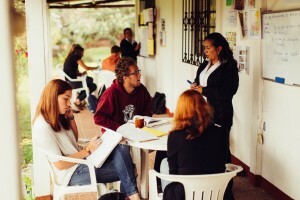 Many congregations offer financial support to students that are entering a Christian educational institute. Make sure to contact your pastor, or church leadership to find out any way they can help. CMU has a Church Matching Grant that can match up to a $500 donation from your church. RESP’s. Check with your parents to see if they have set money aside for your education through a “Registered Education Savings Plan”. Our program qualifies for most RESP’s. It’s also important to note you will receive a T2202A Tuition and Education tax receipt for the tuition portion of the program. This will reduce the cost in the end. Apply for Scholarships and Bursaries. Check with your school guidance counselor and find out what kind of scholarships are available. Most communities have a variety of different scholarships that Outtatown would be eligible for. We also have our own Leadership Scholarship and Bursaries. Check out our Bursary & Scholarship opportunities.